What bars are you running? Nitto ? They're Deda 215 Shallows. Same shame as the Newton Shallow, but 26.0 clamp. After riding this a few weeks, I think I can say this is my favorite road bike I've ever ridden. It's so smooth, rides really predictably, and feels kind of like a freight train rolling along. Coming from a long line of stiff, aggressive, race bikes, there's definitely been a learning curve to the feeling of the frame and fork flexing quite a bit, but I've really grown to love it. Put in 125 miles, including some pretty rough dirt, on it yesterday and besides being sore, my body doesn't hurt at all. Very nice! Always wanted one of these. There is something special about this one. Congrats on a killer build. Love the yellow too! I've put a number of miles on this since building it up and it still regularly surprises me just how smooth it rides. The geo is damn near perfect for me and handles really predictably. 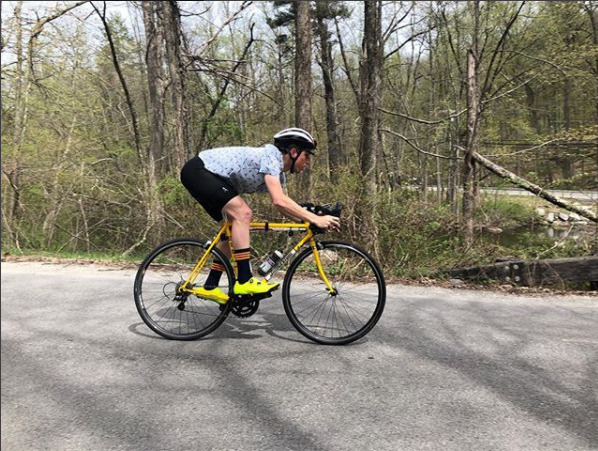 This weekend I put in my longest ride ever (150mi and 13.5k climbing). 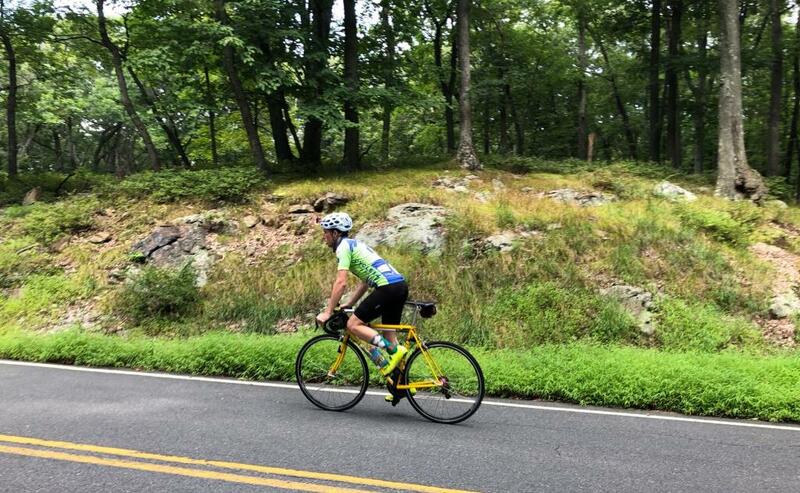 Despite being such a long day, I set PRs through the whole ride, including a bunch of gravel climbs and descents. I had some new wheels built up (King R45s laced to DTR460s) a few weeks back that compliment the bike rather nicely. really cool Jake. I had one of these back in about 2007. Should've kept it. Enjoy it for a long time. jdp pal, you just had the closest thing to a "conversion experience" as one can get on a bike. This think looks amazing! cant wait to see the final . Didn't scrub through the tabs! final is a beaut. Such a classic frame! I looked around for one of these in good condition in my size for a while but gave up. Thanks for all the kind words! This is definitely a bike that'll spend a long time in my stable. Here's an updated pic with the new wheels. Picked this up a couple of weeks ago on a whim, just waiting on some parts to arrive before building it up. All kinds of excited to see what all the fuss is about on these. I too am not sure what all the fuss is about. Here is what I posted on another forum recently. I haven't ridden it yet since the makeover because it has to wait it's turn so I don't know the result. I just wasn't feeling the love for my '92 RB-1 so I decided to make some changes. Originally the bike came with an extremely long stem that I needed to swap out. About two years ago I decided to put on mustache bars with a shorter stem. I got tired of those so I did a major makeover. I replaced the stem and put on drop bars. I replaced the barcons with STIs. I went from 7 to 8 speed. I replaced the 7 speed Shimano 600 rear derailleur with an 8 speed. I replaced the 7 speed wheelset with 8 speed. I swapped out the tires and saddle. I also swapped out the Dia Compe brake calipers for 600s. All the parts I swapped out I had in my parts bin. Hopefully after these changes I feel the love for my Bridgestone. Here are before and after pictures. Well, I'm the only one here. I purchased mine off of ebay 3 years ago. Couldn't resist. It's a size 54.5, which Bridgestone offered for just 3 years (1992-1994). Prior to that, they jumped from 53 to 56, and folks like me who couldn't fit comfortably on either one (too small, too big) were stuck in the middle with no place to go until the 54.5 came out. I rode a 56cm '90 model which I finally sold to a dealer because it became more uncomfortable every year I owned it (2001-2015). The seat tube was fine - it was the long top tube I couldn't get used to, even with a short (80mm) stem. 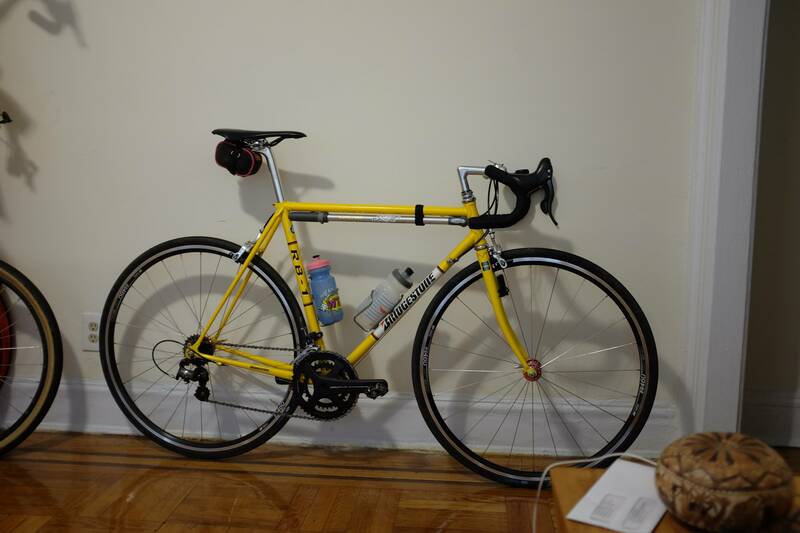 My '93 is the yellow model 8-speed, a grade up from the red 7-speed, bar-end shifter version. The frames are identical, and I wouldn't mine owning both. Months ago, a red '93 54.5 was up on ebay selling for $1600, $400 over what it cost new. The bike was all original down to the handle bar tape and it looked showroom new. No surprise, it didn't sell and the seller took it off. Initial impressions are really good. A couple of tiny tweaks to dial the fit, but otherwise loving it. I notice that your seat is a lot higher than the handlebars. Is that a comfortable position for you? For me, they need to be even.